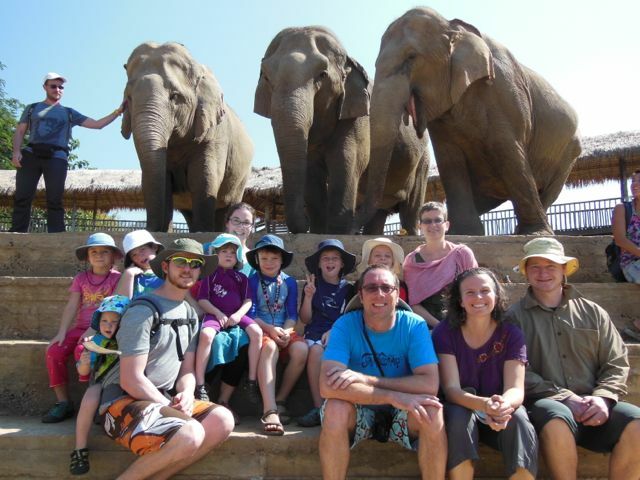 Visiting the Elephant Nature Park has been on my list of things to do for quite some time. 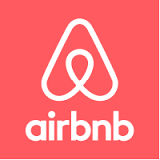 We had yet to do it as the cost was prohibitive for us at over $80 per adult and $40 per child. With a generous Christmas present of cash from Grandma we were able to swing it this time and lucky for us our friends that are traveling with us were keen on treating themselves to this experience as well. 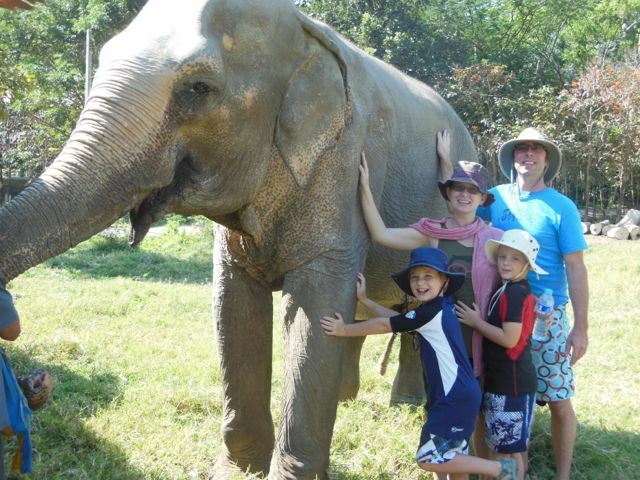 I was unaware of the seemingly rampant mistreatment of the Asian Elephants before visiting the Elephant Nature Park. 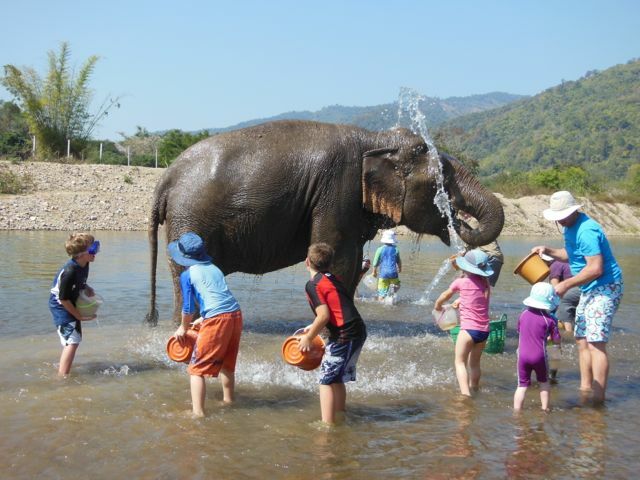 From what we learned today the elephant trainers need to “break the elephant spirit” in order to domesticate them to work in tourist camps providing elephant rides and entertainment. This breaking begins when an elephant is four years old and involves putting them in a small box or cage, tying them so they can’t move and then poking them and prodding them harshly for up to a week until the elephant submits. 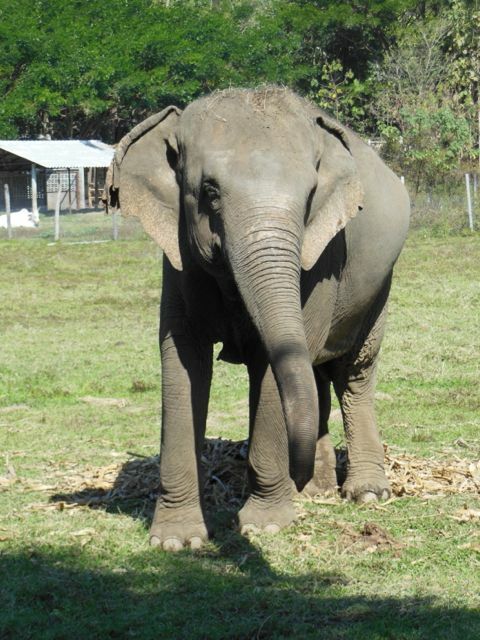 Many of the elephants at the park have been rescued from abusive handlers. We saw many elephants who were blind and were told stories of how one was blinded by its mahout using a sling shot to get the elephant to bend to his will, another by being in the circus and having decades of flash photography ruin her eye site. We met an elephant who had a broken hip from being hit by a truck, another with a mangled foot from stepping on a land mine, and one with a broken leg from being overworked. It was a sobering experience for us all. 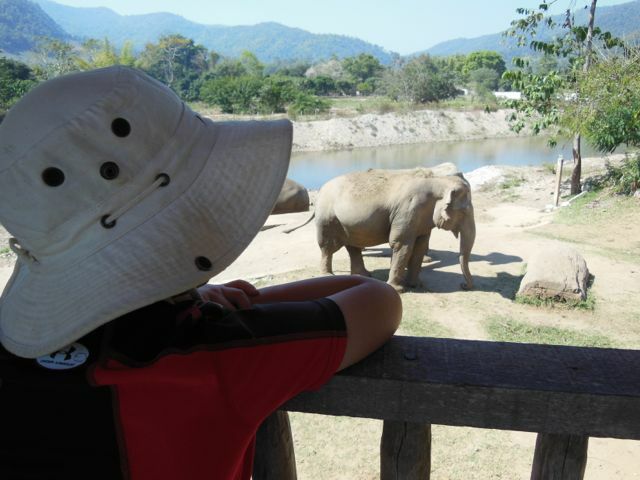 At the Elephant Nature Park there is no show. There is no riding of elephants. In fact I felt that the interaction with the elephants to be somewhat lacking. But after learning more about the situation of elephants I feel this is not a bad thing. 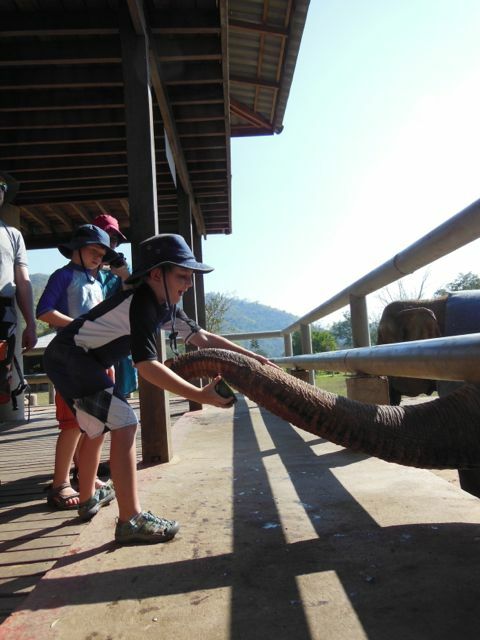 The elephants are not chained and are free to roam the grounds. They come when they know there is food to eat and at such times we were able to feed them and touch their bristly bodies. 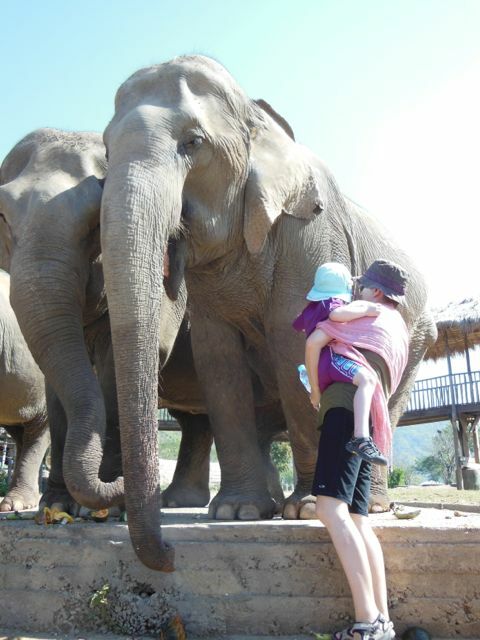 They allowed absolutely no touching of the two baby elephants (except from their mahouts) and at one time we even had to run from a baby elephant who was being “naughty” when he kept coming up to our group to play. Apparently this is a dangerous thing because the babies are not separated from their moms as they would be in a traditional camp and, as we all know, mamas can be fierce in protecting their young! 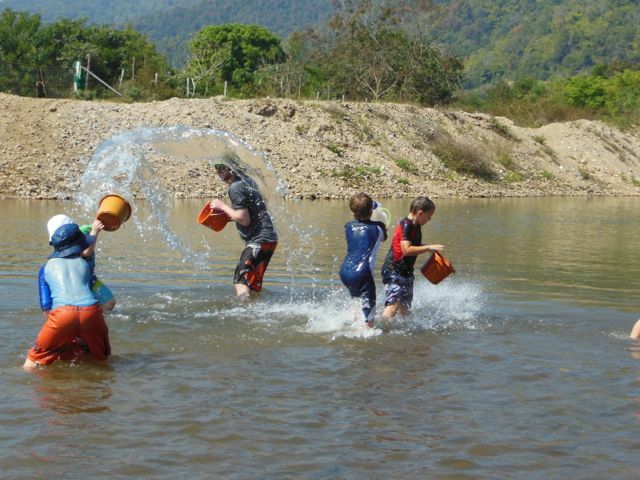 We were able to observe the elephant herds from a safe distance throughout our day and we even got to give an old lady elephant a bath in the river. 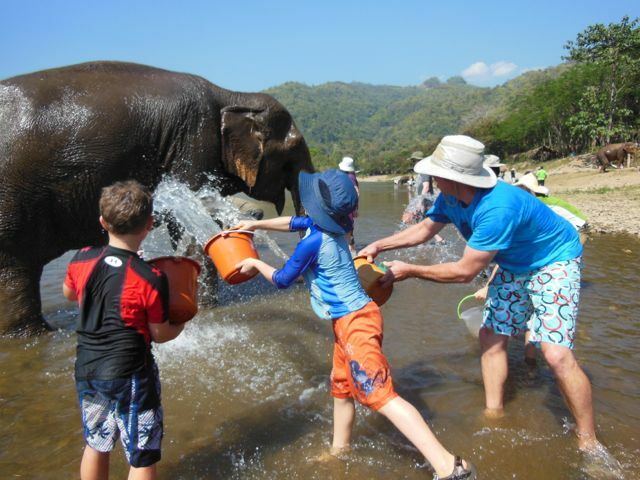 We used buckets to splash the grandma elephant until she was clean and then of course, once the elephant decided she had had enough, our children gave each other a cool down in an all out water fight! 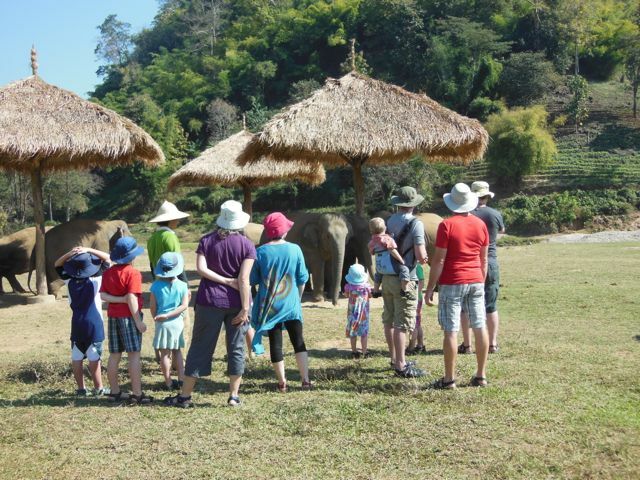 Visiting the Elephant Nature Park was a day of education for us. 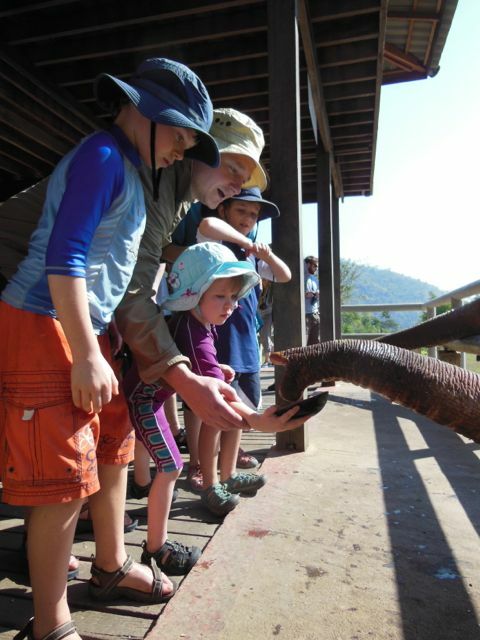 We learned about the bad side of the elephant tourist industry and were able to observe free roaming elephants who are cared for and loved. Although it was an expensive day for us I feel very good that our money went to support such an amazing not-for-profit organization. 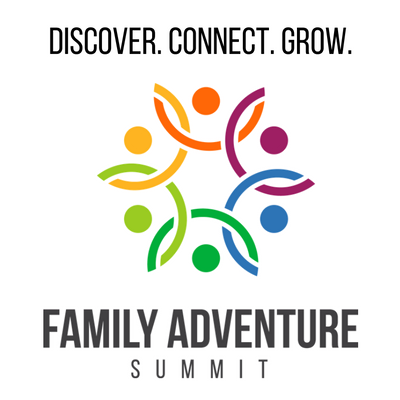 Of course the best part of the day was that our children walked away from our day with a once in a life time experience they will remember for the rest of their lives. Great pictures Amy 🙂 So glad we got to enjoy this experience with your family! I’m glad you are learning about the ugly side of tourism too. This is why I refuse to get my picture taken with the animals the street peddlers are holding, refuse to swim with captive dolphins and refuse to support places like Seaworld. Wild animals belong in the wild. If you aren’t blessed enough to see them in their natural habitat, you should settle for pictures and TV documentaries. No animal deserves to be caged for human entertainment. I’m enjoying your journey!